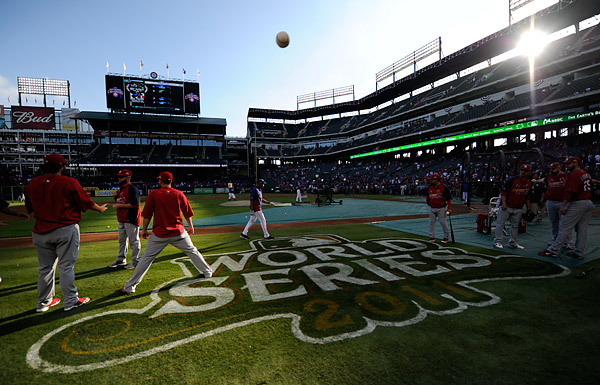 It was once again a picture perfect night for baseball in Arlington as the Rangers and Cardinals readied for Game for Game Four of the 2011 World Series. Game Four was the complete opposite of Game Three. 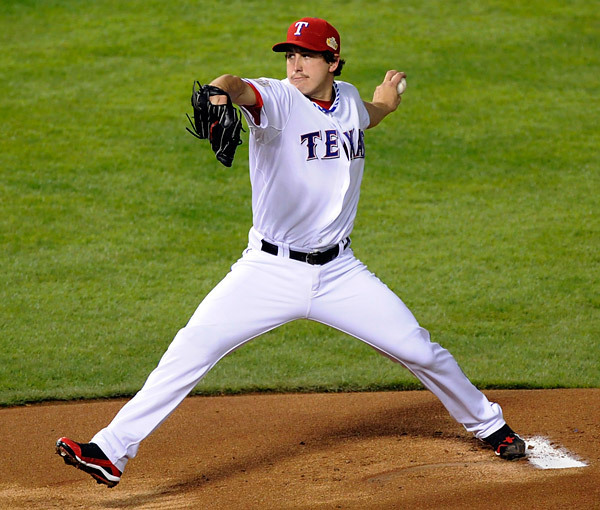 It was all about pitching, specifically the pitching of Rangers southpaw Derek Holland. Holland spun eight innings of two-hit, shutout baseball as the Rangers came away with a 4-0 victory to knot the Series up at two games apiece. My shooting position for Game Four was in a freshly created elevated spot along the first base line. It doesn’t compare to the spectacular elevated position we have in St. Louis (from which I am scheduled to shoot Game Six from Wednesday night), but with the help and persistence of MLB Photos Director of Photography Rich Pilling communicating our needs to the Rangers stadium operations department, a riser built high enough for us to see over the heads of standing Rangers fans was built just prior to the Game. There is no avoiding hands held high waving rally towels, but in that case, you just shoot through the frenzy of towels and hope to make one decent frame. It worked out very well. 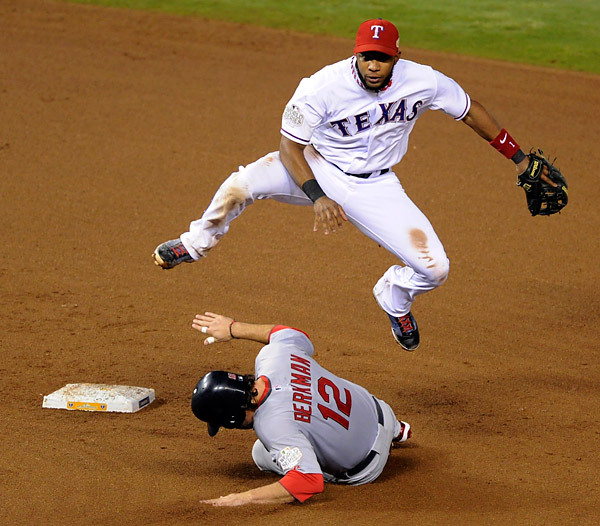 The Rangers win made one thing certain… we would be heading back to St. Louis for a deciding sixth or seventh game. There hasn’t been a seven game Series since 2001, which helped fuel the excitement for our return trip to the City by the Arch. The only fly in the ointment is the weather forecast for Wednesday night., which as of now is a 70% chance of rain at game time. Could be worse. 100% would have me a bit worried. No rain outs please! I’ve got plans for Friday night, and would hate to have them cancelled! Mother Nature, once again, will be in charge. Be nice, my lady weather friend! 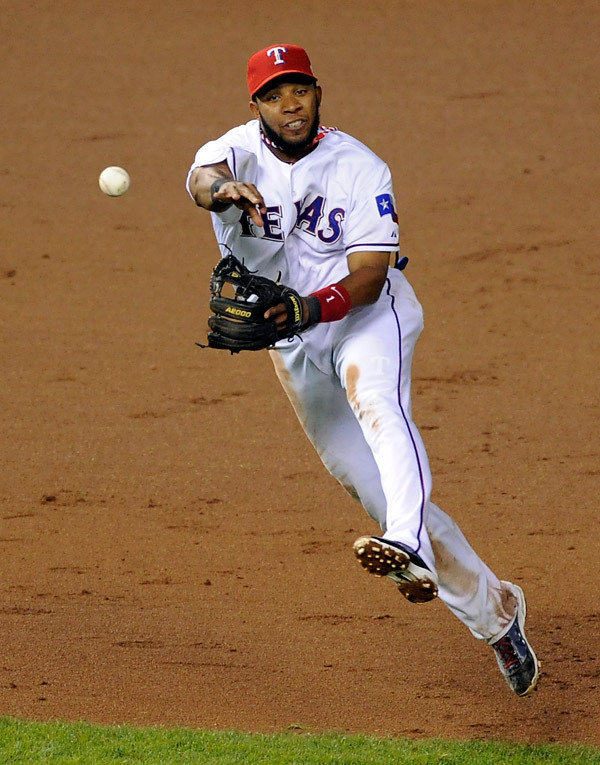 The Rangers displayed some nice defense while shutting down Albert Pujols and the rest of the Cardinals lineup, particulary Elvis Andrus and Ian Kinsler. 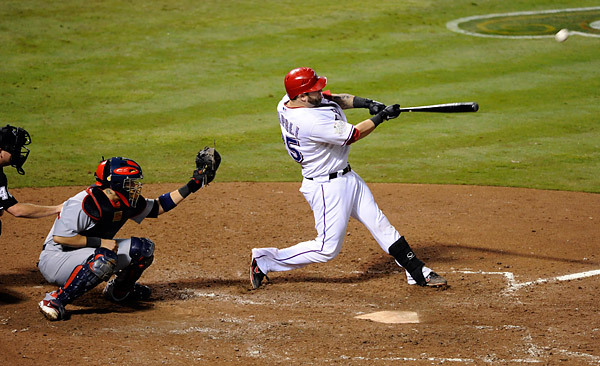 Mike Napoli was the offensive hero of Game Four, breaking open a tight 1-0 game with a mosterours three-run home run in the sixth inning. 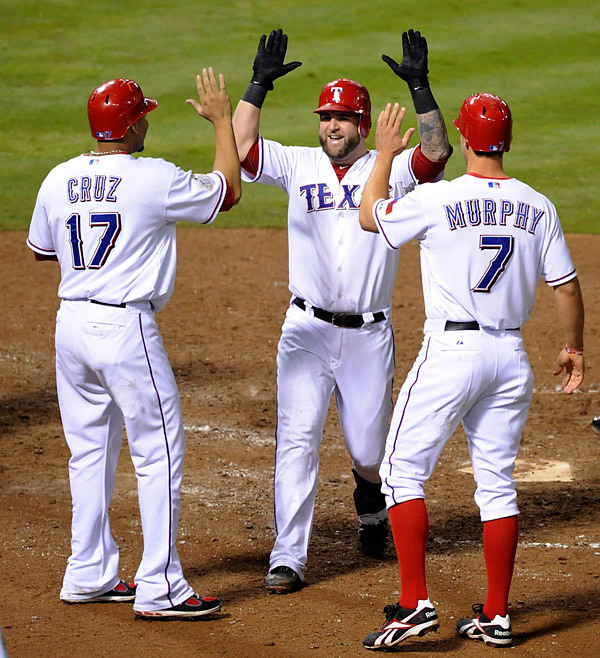 Napoli turned around a first ball fast ball delivered by Mitchell Boggs to give Holland and Neftei Perez all the run support they needed to bring home a Ranger win. My Game Five update will follow shortly. With a travel day set for today, I am soon to be boarding my Southwest flight and meet up with the rest of the MLB Photos team for dinner tonight at Charlie Gitto’s on the Hill. That in itself is worth the trip back to St. Louis. Until then, so long from Arlington. This entry was posted on Tuesday, October 25th, 2011 at 11:23 AM	and is filed under Assignments. You can follow any responses to this entry through the RSS 2.0 feed. Love the clean backgrounds of the elevated position. I just wanted to mention that 2002 was the last Series to go to 7 games, not 2001. The only reason I even thought of that was because Brad Mangin’s blog update after Game 4 said it (and his Giants lost that World Series of course). Keep the updates coming though! If you want to answer, I did have a question about the lens you use from that elevated position. Is it the 500mm f/4 lens? I’ve noticed you mention using that lens semi-frequently. In your opinion, is the 600mm f/4 too long for shooting from that position or is there another reason you prefer the 500mm over the 600mm? If I had to guess, you only want to travel with one lens longer than 400mm and the 500mm is probably better suited from more positions than the 600mm since you can crop in if needed with the 500mm. Having total freedom of lens choice for a day and ignoring assignments, do you prefer the 500mm or 600mm? Ben- You are right on regarding 2002 as the last Series to go 7. Regarding my lens of choice from the elevated position, I am using the 500 f/4 for the Series. Actually, I use this lens a lot during the regular season as well from field level. I tend to use a 600 elevated when I’m not traveling. IMO if I had to chose one long lens, it would be the 500 f/4. Much more versatile and it is extremely sharp with a 1.4 teleconveter on it. Thanks for the response Ron. I was curious since I know 400mm doesn’t quite get the reach I want sometimes when using a full frame sensor and teleconverters don’t always produce the best results for night games, particularly when it comes to focus speed. So it’s good to know what works best beyond 400mm for baseball. It’s fun to get in really tight sometimes to get those details you don’t otherwise see. I know Brad Mangin uses that Canon 800mm sometimes to get those details, but I can’t imagine what a baseball game must look like through that long of lens.